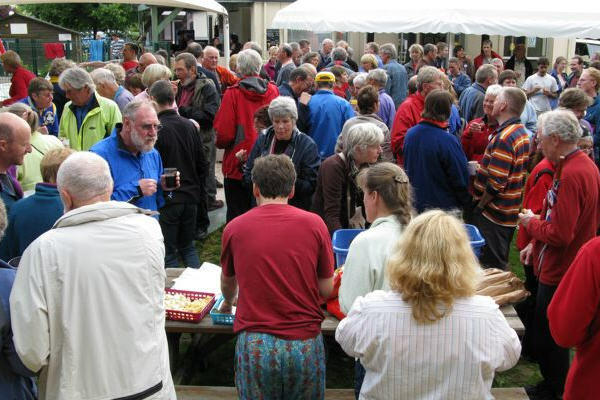 Despite French fishermen blockading ferry ports protesting about the crippling cost of diesel fuel and scare stories of fuel shortages for our vehicles, a good crowd attended the 2008 International Tandem Rally based at Camping la Citadelle in Loches en Touraine. Weather: On and off rain. The arrival day for the majority of ralliers. Weather looking rather disappointing after some lovely sunny and warm days (so we were told by early arrivals!). A well attended Welcome party in the evening with wine, bread and cheese. The first café on route at Chatillon-sur-Indre soon sold out of apple pie! The weather stayed kind to the picnickers and sunshine was enjoyed. Unfortunately for the pétanque competitions, the rain was falling by now, though several people braved the weather to compete. Weather: Sun, cloud, light rain, fine. Very short routes today to allow people to get back early to have a look around Loches: some extensions were done by the very keen. A nicely planted out rest stop presented itself at St. Bauld with a circular marble table and accompanying benches, providing a very pleasant rest stop. 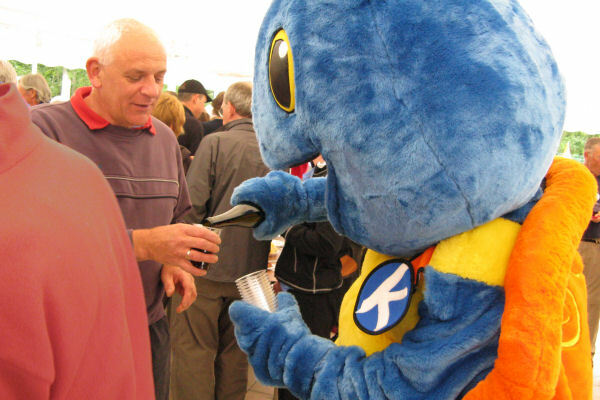 In the evening we were summoned, by a large blue turtle on the back of a pickup, to a wine tasting given by a local viticulteurer; some very good wines and also some very tasty cheeses. Weather: Rain all day with thunder and lightning too. Unfortunately this day started with heavy rain and kept it up all day. Some hardy souls braved it, though it was later found out that the majority of ralliers had "stayed in"! A lovely route, starting out along rather wet forest tracks, with a coffee stop found in Genil. Château de Montrésor was worth a look around as was the town of Montrésor, with another welcomingly warm café being found. 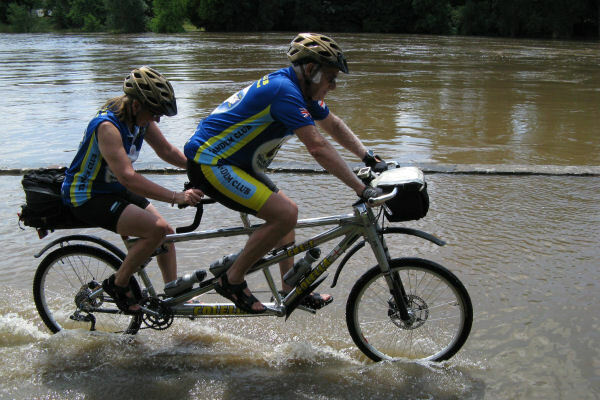 Tuesday's Montrésor route was explored by many and reports came back of extreme flooding with a long, narrow, raised walkway beside a flooded road having to be used, even by a tandem trike! 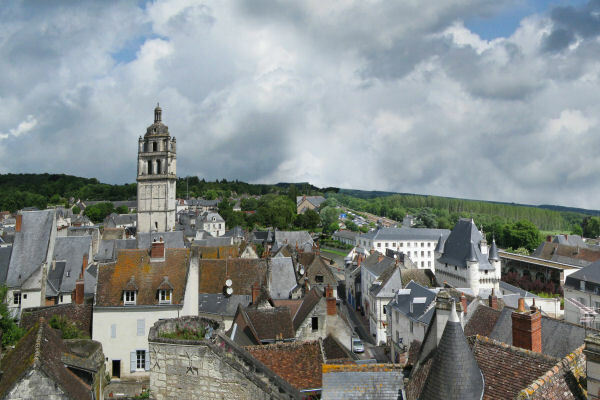 Others enjoyed the sunny day by visiting the Loches market and the very interesting Citadel. 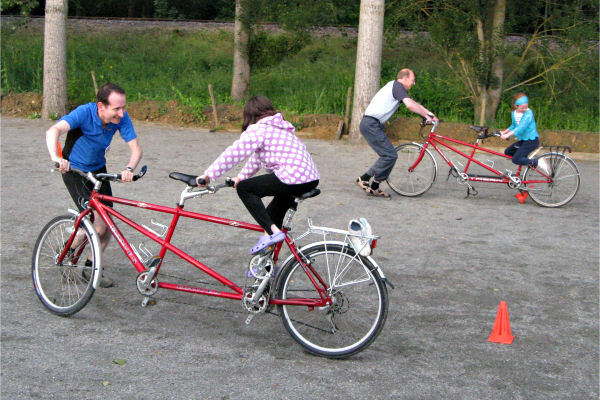 In the evening the Tandem Games were held; this time they were mostly in the form of skills tests, ie pushing tandems backwards through bollards both with and without stokers, turning the tandem within an ever decreasing "box", slow races. The rain stopped early on in the ride; the swollen, flooded rivers were very evident with water still pouring off the fields onto roads. 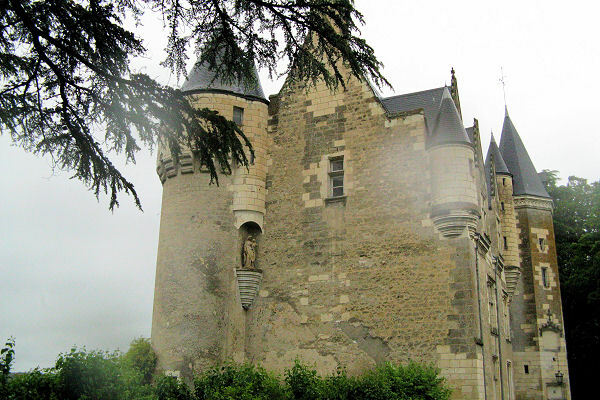 A pretty route with several villages "displaying" masses of roses, particularly Chedigny. A nice stop in the sunshine by Reignac-sur-Indre's war memorial for refreshment; on to Cormery where several families sat at conveniently placed picnic tables, by the very swollen Indre River, to eat their picnic lunches whilst others found cafés in the town. 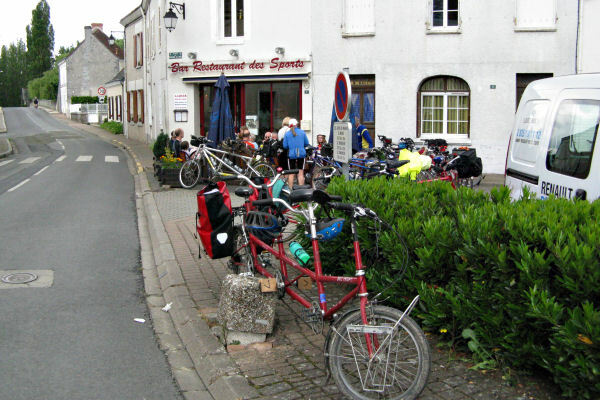 On the return route a café was discovered in Reignac-sur-Indre which quickly was "over-run" with tandemists! In the evening Madeleine gave an interesting, audience-interactive talk about King Charles VII's "favourite", Agnes Sorrel - "favourite" apparently being different from "mistress" as the Queen had given her approval to this liaison after already bearing 12 children! Weather: Sunny, hot, rain, fine. A lovely sunny, hot day. 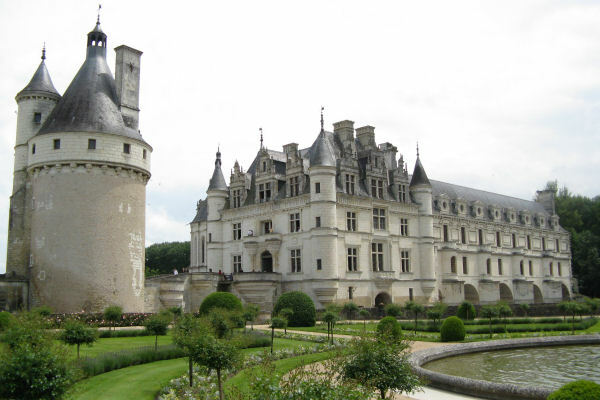 Some families did the "car assisted" ride which enabled them to visit the châteaux of both Chenonceau and Amboise if they wished. 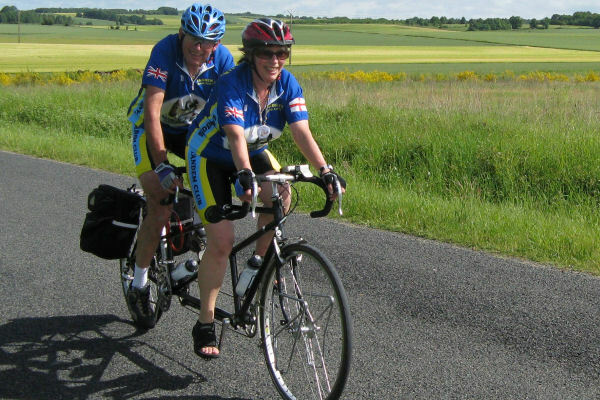 For others it was out along the forest tracks, where unfortunately "blow outs" were experienced by a couple of teams, to ride in the rolling countryside. A coffee stop was found at a hotel in Luzillé and most people stopped at a café in Francueil for their lunch, whilst some intrepid teams decided to explore the suggested picnic spot beside the River Cher - a very swollen river with the picnic benches being completely submerged and only the table tops being visible and the river starting to flood across the access road; a grassy knoll was found right by the rushing river with even a campsite café providing coffee after the picnic (the campsite had been completely cleared of tourers though as the owners told us the river was expected to rise by another 1.4m in the next 24 hours - by Sunday morning this access road was completely covered with deep water and the road had been closed). From here it was a very short distance to the Château de Chenonceau where many ralliers enjoyed a visit to this most spectacular château built across the River Cher. Riding home in very hot sunshine we could see a lot of very black clouds over Loches and, entering the forest, the rain fell on us, though most managed to miss it. The flooding on fields and roads had still been extensive and returning via the back roads of Loches we found that the water coming off the fields to join the river had completely covered the road to above pedal height! We were lucky to enjoy a fine evening for our walk to the Agnes Sorrell Hall on the other side of Loches where we arranged ourselves at long tables, filling the hall. The Mayor gave a speech, followed by Isabelle, the campsite owner, who thanked us all for coming and welcomed us back again; presentations were made, xylaphones were played. Wine and an interesting buffet was enjoyed. 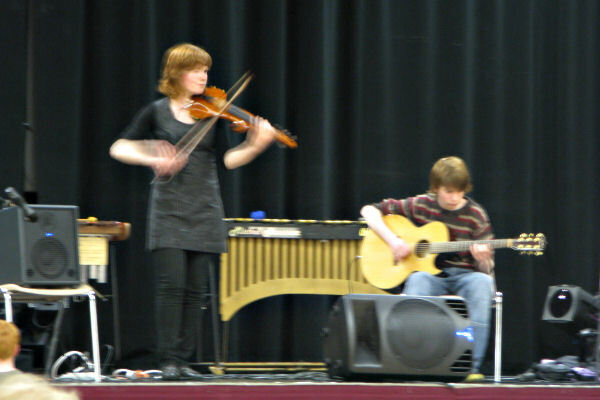 Héloïse & Josselin entertained us with some amazing violin and guitar playing. Weather: Sunny, warm, rain, thunder, lightning. Fortunately it was a dry, warm morning which helped in the packing up of tents, cars, etc. For the handful that remained it was a very quiet site after everyone had gone, leaving a feeling of anti-climax after an excellent week's rally, despite the very mixed weather. Neil had chosen this venue a fair way down south in the hope that he'd beat the "rally jinx of poor weather" that the Tandem Club had been experiencing lately at its rallies and the rain still followed us! It really doesn't matter, Neil - it was an excellent campsite at an excellent location with lots of good company. Our thanks for your and Tony and Janet's time and efforts, which are greatly appreciated. Joel Frandzel has sent us some pictures which we show in this section, click on this picture to view the set.